Independent game developer, founder of Awesome Games Studio. Former gameplay programmer at Tate Interactive studio. Born in 1987, living the indie dream since 2010. Thursday 27 February 2014 at 2:12 pm I've just decided to change the character of my blog. I haven't been very active here - I didn't even announce that Yet Another Zombie Defense got greenlit and is coming to Steam. That's mainly because I'm not seeing much effects of posting here and also it's difficult for me to write long posts. So from now on I'll be switching to Twitter for updates on my game development efforts and I'll keep the blog only for posts on specific topics. My personal Twitter account is @MarcinDraszczuk - that's where I'll post most often. Alternatively you can follow my business account @AwesomeGamesStd - only important announcements, trailers, game releases etc. will be posted there. After a nearly 6-year long marathon, Oozi finally comes to Steam. Here's the story behind it. Thursday 05 December 2013 at 7:11 pm It's been a long and bumpy road, but we’ve made it. Oozi is now available on Steam. It all started back in 2008. At that time Andrew was working full time as a 2D artist at a studio called InImages. They made platformers targeted at children that they sold via casual portals like Big Fish Games. But he always dreamed of making a game not only for kids, but also for those who played platformers of the early 90s in their youth. A game that would remind people of Super Frog, Rayman or Mario - classics of the genre. He managed to convince his friend, Peter, who was a programmer at a corporation, to join his endeavor. They started working on the game, Andrew full time and Peter in his spare time. They chose to use an engine made specifically for 2D games, but a few months later it turned out that its performance wasn't satisfying and they started looking for another tool. Microsoft's XNA hooked their attention – it was designed specifically for small developers, but still powerful enough to achieve their goals. The possibility of publishing the game to Xbox Live Indie Games was a nice plus. It soon turned out that it'd be impossible to complete the game in six months, but they kept working on it. Andrew was lucky that another friend of his moved abroad and needed someone to look after the flat he rented to students, and he offered Andrew the chance to live there paying very little rent. This allowed him to keep his cost of living really low, though he didn't expect he'd need to do so for such a long time. Another year passed and the assets for the game – art, animation and level design were nearly complete. However, due to Peter's limited time, only the most basic gameplay mechanisms were implemented and it was clear that at this speed, it'd take years to complete the game. Peter decided that he wouldn't be able to complete the game. So Andrew started looking for a new programmer. One of his friends that I knew from work at Tate Interactive mentioned this to me and that's how we started working together. Since I already had quite a bit of experience with XNA, I was able to take over the project seamlessly. I was also able to work full-time on Oozi thanks to the funds earned by the previous games I released on Xbox Live Indie Games. In March 2011 we had all the levels of the first world ready. We decided to release them as Episode One of Oozi: Earth Adventure on Xbox Live Indie Games, mainly because I believed that a smaller and less expensive game is a better fit for that marketplace. The sales weren't very impressive, but Xbox Live Indie Games was never our main target – it was dominated mostly by games for teenagers. We kept telling ourselves that it'd be much better when we released the complete game on Steam. So we kept working hard and in February 2012 we had the game completed. We submitted it to Valve and waited for their reply. It came two months later and was negative. It shattered us, but we didn't give up. We started talking to various publishers, but they weren't interested either – platformer was an unprofitable genre to them. However, a brink of hope appeared - in June, Valve announced that they'd be opening a service called Steam Greenlight. Two months later they did and we submitted Oozi within hours. We received hundreds of positive comments, but shortly after the initial rush, the traffic dropped and it was clear that it would take a long time before we got greenlit. We tried everything – giving away copies of our game, selling it in bundles, paying for PR and advertising – but nothing worked really well. We knew that an old school platformer targeted at now 25+ gamers who played games in the 90s was kind of a niche, but we didn't expect it'd be so difficult to get the game greenlit. When we realized we wouldn't be able to release the game on Steam anytime soon, we both had to take a job to pay our bills – I returned to Tate Interactive where I used to work before going indie and Andrew took a job at Nimbi Studios. As months passed we were slowly losing hope, until Valve made an announcement that they were increasing their throughput and greenlit 100 games in August 2013. We suddenly appeared in the Top 100 most voted games and started to believe that we'd get greenlit soon. It finally happened in October 2013, 14 months after we submitted it to Greenlight and 20 months after we contacted Valve for the first time. We decided that we needed to make our Steam launch as good as we possibly could. We've gathered all feedback we found, both from gamers and from reviewers. We've addressed every common concern that has been made – we've improved controls, added some cool features like other players' ghosts and even talked to our sound designer about reworking some of the sound effects. The extension of development time and feedback we got from multiple sources led us to making an even better game than we initially planned. We'll soon find out if we were right and there's a market for a nostalgic 2D platformer with no puzzle, or if we were wrong all that time and Oozi was doomed from the beginning. No matter if it is a success or not, we're proud that we never gave up and eventually managed to achieve our goal. Andrew is a runner, he's been preparing for a half-marathon for a couple months now – but there's one full-length marathon he’s already completed. Friday 22 November 2013 at 09:50 am Three weeks ago, on October 29th, we've received green light from Valve to release Oozi on Steam. We've been working hard to integrate the game with important Steam features like leaderboards, achievements and cloud saves. We've also added some cool features like player ghosts, improved controls and made many other minor improvements to make sure that our Steam launch will be as good as possible. We're currently aiming for December 6th as our release date. Monday 30 September 2013 at 8:26 pm The last couple months brought some big changes to the world of indie developers. The loudest ones were annoucements of independent developer programs both for Playstation 4 and Xbox One, but one that came pretty unnoticed was that Steam is going to accept much more entries than it used to for publishing. Last month they greenlit a hundred titles and they're saying that they'll continue to increase their throughput. This is a game changer for every small-sized indie developer. Being able to publish your title to a 50-million audience of core gamers is something that I've always dreamed of. And that's the main reason I decided to work on Oozi – I was really disappointed with how Xbox Live Indie Games developers were treated by press, gamers and by Microsoft. Oozi was a bigger, more polished title than any game I had made before and I was hoping that it would allow me to leave XBLIG, but unfortunately it still turned out to be too low to be approved by Steam. However, with the changes to Steam's publishing policy, we might be able to finally have it released – we're currently sitting on #61 top voted spot, and with Steam's current rate of approving titles, we should be greenlit by the end of November. 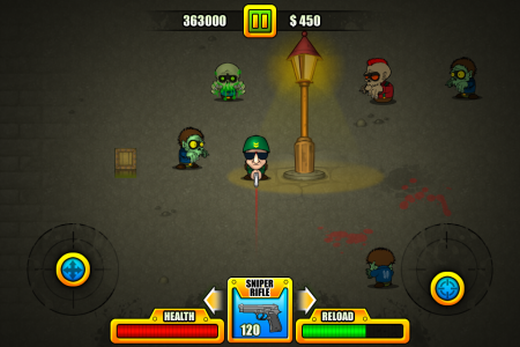 When I found out about this, I decided to submit two other titles – I, Zombie and Yet Another Zombie Defense. The former is doing fairly well and the latter a bit worse, but it’s possible that I'll have them both released on Steam in the next year – something I never thought might happen. All those changes – the opening of Steam's gates, and the arrival of next-gen consoles, make me lean towards the decision of abandoning XNA and switching to Unity. While XNA is a great tool and I have a lot of experience with it, is has officially been pronounced dead by Microsoft and doesn't officially support any platforms other than XBLIG and Windows. I'll certainly keep using it to deliver Yet Another Zombie Defense 2 to Xbox Live Indie Games and possibly to Steam, but I'll probably also port the game to Unity – which will allow me to release it for all mobile platforms and maybe next-gen consoles as well. And that's where my adventure with XNA will most likely end. Tuesday 25 June 2013 at 7:13 pm As you may have noticed, my last blog post was in April 2012. What has happened since then? A lot of stuff. Why didn’t I write about it? Perhaps because I was waiting for a piece of good news to post - unfortunately, there has been none. In my last post I mentioned that we were still waiting for a response from Valve. The answer came five days later, and it was a generic “your game is not a good fit for Steam” reply. We were shattered at that time – the most important, or even monopolist, PC distributor had rejected our game. This was probably the main reason why I stopped posting – I couldn’t force myself to write that over a year of my work would probably turn out to be wasted. Three months later Valve announced Steam Greenlight and we regained hope. But when it finally launched in late August, it turned out that Oozi isn’t a game that appeals to a mass audience. Sure, there were some people who liked it, but there was simply not enough of them to greenlight the game; and when we released the game to the public through our website, we realized that critics didn’t fall in love with it either – Oozi’s metacritic score is just 67. We’ve made a somewhat decent, but not exceptional game, with no means of distributing it to our target audience. As a result, I had to return to my job at Tate Interactive. I was lucky that they needed a programmer at that time to help them port their Vita game, Urban Trial Freestyle, to PS3. Being an ex-employee I was a good candidate: I knew their engine, their workflow and we trusted each other. So most of my time between July and December last year was spent doing contract work that helped me not to run into debt. Of course I never gave up on indie development. In my spare time I was still working on the iOS port of Yet Another Zombie Defense, with visuals redone by Andrzej, the artist who created all the art in Oozi. The game was ready in February, but as I learned, the iOS market was even harder than XBLIG or PC. It’s so oversaturated that you really need top production values to get any attention. In addition, you need to understand your audience and monetization model - simply porting a successful game from another platform may not work as you might expect. 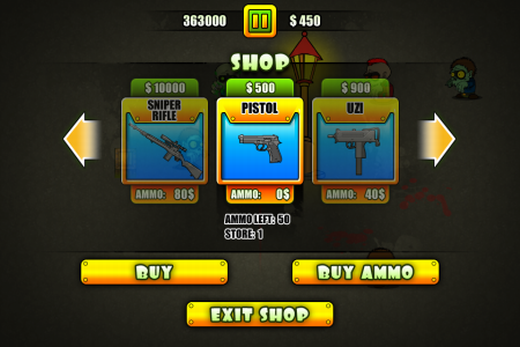 When I realized that the release of Yet Another Zombie Defense on iOS was a flop, I decided to switch back to the market that I knew best and that I had the greatest success with – XBLIG. I chose to make a game that I have had in mind for a long time – an extremely difficult vertical scroller with avatars. It wasn’t very successful either, but at least it took me only about a month to develop, and it still may turn out to be profitable. So now here I am. I haven’t earned much money over the last two years, but I’ve learned a lot. Hopefully that knowledge will help me make better business decisions in the future. 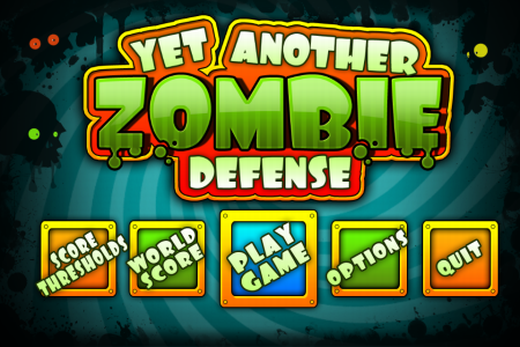 My next move is to release a sequel to Yet Another Zombie Defense on XBLIG - something I should have done long time ago. However, there are still some good news unrelated to Oozi. It's too early to share them, so I'll just say that I'm really excited about the future :). Sunday 11 March 2012 at 4:36 pm Still waiting for Valve's reply. In the meantime, slowly moving on with YAZD's mobile version. Hope that the next time I post here I'll have some big news to share (good or bad). Saturday 25 February 2012 at 9:27 pm We have finally submitted full PC build of Oozi: Earth Adventure to Valve and now we're waiting for their decision. 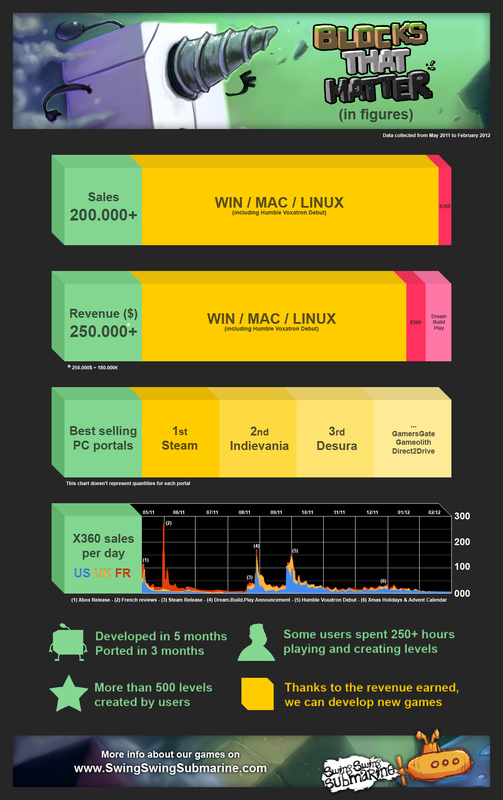 We have really high hopes that we'll be able to make some decent money on Steam, especially since Swing Swing Submarine published their sales data of Blocks That Matter (in short - 20x more sales on PC than on XBLIG). As you can see, it's completely 2D. I decided to abandon 3D because of wide variety of Android devices - I'm afraid that some of them wouldn't be capable of running the game smoothly, and sometimes 2D art looks even better than 3D. Sunday 12 February 2012 at 6:59 pm The title says it all - today we have released the third episode of Oozi: Earth Adventure on Xbox LIVE Indie Games service. Another good news is that the PC version is pretty much ready, we're just doing some final testing. Now we're going to submit it to Valve and keep our fingers crossed they accept Oozi for distribution on Steam. Other than that I don't have any plans for upcoming weeks... So I think I'll just take a break from work and see how things shape up with Steam. Sunday 29 January 2012 at 6:04 pm The third episode of Oozi is completed. Right now I'm doing some final quality assurance (which basically means playing through the game and trying to max out every challenge and arcade level). We'll probably submit the game to XBLIG peer review tomorrow and it should be available for download by the end of the week.